Hampton Bay Cotton Valley Oak displays a rich brown hue patterned with subtle dark brown and black flecks suitable for both traditional and modern home spaces. The 12 mm beveled edge planks create a realistic oak floor look while providing the strength and durability of laminate. Easy to install without glue or nails, each board is a substantial 12 mm thick, 4.96 in wide x 50.79 in long and has a 25 year warranty for peace of mind. A timeless, versatile pattern, Hampton Bay Cotton Valley Oak is proudly manufactured in the USA. 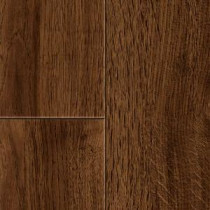 Buy online Hampton Bay Cotton Valley Oak Laminate Flooring - 5 in. x 7 in. Take Home Sample HB-531608, leave review and share Your friends.